Before opening up her own counseling office, Clear Innervision Counseling Service, Rhonda “worked as a therapist in inpatient mental health unit in hospitals for adults and children, partial hospitalization program, residential unit for adolescents and youth, outpatient mental health settings, medication clinics and in-home therapy.” When she was making the decision to begin her own practice, she was looking to set up shop in a community that needed her expertise. “Mental health issues are still stigmatized in the African American community,” Rhonda says. “The common attitude is ’Don’t put your business on the street.’ ‘We’re not going to talk about that now.’” Rhonda believes that “This doesn’t solve anything,” and she is in business to help people cope with their mental health issues in a productive, healthy way. Whether you’re an adolescent, or a senior – someone with ADHD, Depression, or LGBTQ related issues – a couple who needs counseling, or someone who needs help finding a healthy work-life balance, Rhonda has years of experience helping people navigate mental health challenges. Clear Innervision Counseling Service is unique to Grandmont Rosedale. It is also the neighborhood where Rhonda grew up, so choosing to locate her business here made a great deal of sense to her. “I opened my practice here because it’s in a neighborhood. My business is about helping people, so I need to be around people. I came to where they are.” Rhonda has “a passion for working with seniors.” Her grandmother struggled with Depression which worsened when her physical health prevented her from getting out of the house. Rhonda is very familiar with the mental health issues that can come with isolation and failing health. Rhonda’s grandmother got help and found she could enjoy her life in spite of her health challenges. “Family members often think that if there isn’t a major issue, then their senior loved-ones are fine,” Rhonda explains, “but sometimes seniors are quiet because of Depression. They sometimes become resolved that their lives are not going to get any better. It doesn’t have to be that way.” To accommodate the needs of some seniors, Rhonda does in-home counseling and she visits patients in hospitals and nursing care facilities. In short, if there is someone in need of Rhonda’s trained support, she will go where the need is. The space Rhonda has created at 19304 Grand River is calm and comfortable, like a friend’s living room. Rhonda had this in mind when she renovated the former hair salon. She had about 16 clients when she opened and her business is doing well. Like so many businesses in Grandmont Rosedale, news of Rhonda’s abilities has spread from neighbor to neighbor, and that’s just how Rhonda likes it. 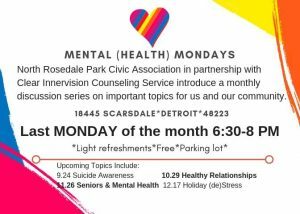 She has introduced herself to the other businesses in the neighborhood, and is currently offering a monthly discussion series, Mental (Health) Mondays at the North Rosedale Park Community House, 18445 Scarsdale, the last Monday of the month through December 17 from 6:30 – 8 pm. Rhonda chose Grandmont Rosedale not just because of the long tenure of many residents, but also because of the healthy business community. It’s often the case that a barber or hair dresser might be the connection between someone who needs some mental health care and what Rhonda offers at Clear Innervision Counseling Service. Clear Innervision Counseling Services is at 19304 Grand River. You can like Clear Innervision on Facebook, call Rhonda at 313.693.4706, or email Rhonda at clearinnervisioncs@gmail.com.